The Cold War will eventually come to an end, but for now it's as frigid as ever on this FX series. But while the war may be cold, the emotional journey of the characters is anything but, which is very evident as The Americans Season 4 Episode 1 begins. 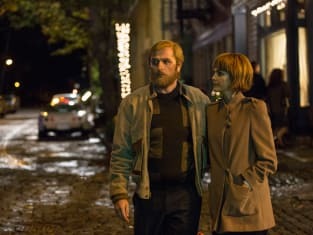 Throughout the premiere, not only are we reminded that Paige is dealing with the news her parents are not who she thought they were, but Philip is heavily invested in EST, making him far more introspective than usual and Martha discovers the heavy price associated to being involved with Clark's work. There was a time when it was easy to worry about Martha and her future. No more. That's not to say anything happening with Martha is pleasant, because it's not. But she's a strong woman and her husband, Clark, cares for her despite himself. Philip is allowing himself to become Clark more often than not these days, and that's putting Martha in a better position. Until "Glanders," I imagined Philip leading a double life. But going to EST has really gotten to him in the most crazy way. There almost needs to be a third person for him to identify with when he's out with Sandra, for instance, because he's yet someone else entirely, but he's more Clark than he is Philip. He's feeling, and that's not something Philip nor Clark should be doing in the spy business. The development has been coming for a long time. Elizabeth sees it, but Philip isn't sharing. It's affecting his work. He's hesitant to make contact with their assets and imagines surveillance where there is none. His instincts are off. Part of it has to do with Paige's discover of her parents' life. But Philip doesn't know the half of what she's going through. At least neither he nor Elizabeth knows Paige told Pastor Tim. Pastor Tim, however, doesn't seem to take what Paige said to heart. Unless he's really one of the most clueless people of his times, Pastor Tim thinks Paige is having a typical teenage moment. Thank God. Pun intended. Paige is going through so much more, and it will soon filter back home. How long can she skip home room at school so she doesn't have to Pledge Allegiance to the United State of America before someone takes note and calls her parents? Would Elizabeth and Philip be able to handle Paige's truth is they knew of it? The way Elizabeth tried to explain conversations with assets being private because they didn't understand they really want to make the world a better place...and would you like some eggs? didn't seem to indicate she'd be on track. The places Philip is sharing is EST and with Martha and Clark's apartment. First he had to tell her about Gene. His desire to do that came in the middle of the night when he was thinking of his childhood, terrible memories of killing apparent bullies who were after him for stealing milk. He didn't share with Elizabeth. But with Martha. Martha feared about Gene and worried over his death, blaming herself. But Clark assured her killing Gene was to protect her. And I believed him. He's not just killing to ensure the safety of an asset anymore, but to ensure the safety of someone he has come to care about. When he looked at the wedding photo of Martha and Clark on her end table, it meant something to him. His marriage to Martha is different than his marriage to Elizabeth, but a marriage all the same. But something is going to have to give. As much as Philip is feeling, and as much as I as a viewer enjoy it because dammit, I really like this guy despite all the terrible things he's done over the seasons, one wrong move can get a lot of people killed. That was evident when Stan paid Philip a visit for sharing dessert with Sandra after EST. What good is a bio-weapon if it's crushed to smithereens in your pocket and the damage is done? It's more important than ever to get himself together. Or is it? Here's what l know about that vial. Glanders is mainly an equine disease, doesn't move person to person and there is no vaccine. It's fatal if left untreated for seven days and there is a list of known drugs that seem to treat it. Whew. Maybe those drugs weren't available then. Not-whew. For no other reason can I think it would have been considered dangerous at that time. Weird that the scientist didn't even tell Gabriel what was coming his way. I know. I've done a lot of talking about Philip and Martha. It felt like this was their hour. Other than them, we had the introduction of bio-weapons, Paige's exploits and minor play with the Soviets which didn't really tie in too much with the theme other than Arkady's discovery of Tatiana and bio-weapons talk. If this episode set up what's ahead for the season, it's going to be espionage on the most personal levels with high tension and life-altering decisions ahead. While we already know what happens to the Soviet Union, we have no idea what happens to the Jennings, and that's where the drama lies. We'll be here all season, so dig in and let me know what you thought of the premiere and your hopes for The Americans Season 4.